Led by Angela Maki Vernon, Ocean's Love is a volunteer-based surfing school dedicated to children with intellectual and physical disabilities. The activities started in 2005 with the aim of helping children with disabilities to love the sea and discover its wonders and energy as well as warming their hearts. The activities, which started out on the Chigasaki coast, have now spread across the entire country. LDH JAPAN also shares this idea and has been supporting these activities since 2010. 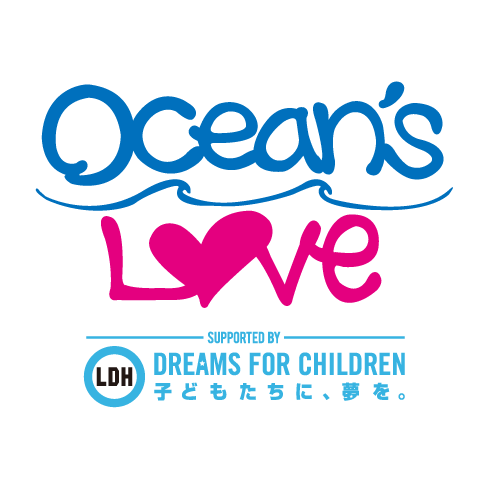 "Ocean's Love" will continue carrying out activities in order to bring smiles to all children in Japan. 2019.3.25Ocean's Love Surfing School starts to recruit volunteers and enroll new students in 2019! 2018.5.10【Event Report】Ocean Course held by Ocean's Love started! 2018.4.10Ocean's Love's surfing school starts to recruit volunteers and enroll new students in 2018! The Ocean's Love activities started out on the Chigasaki coast (Kanagawa Prefecture) in 2005. Ocean's Love is now carrying out activities mainly in Chigasaki, but we aim at holding activities nationwide. So far, activities have been held in many places around Japan, including Irago coast (Aichi Prefecture), Aoshima coast (Miyazaki Prefecture), Kyotango coast (Kyoto Prefecture), Koura coast (Shimane Prefecture), Hamada coast (Shimane Prefecture), Hama-Atsuma coast (Hokkaido), Tatado coast (Shizuoka Prefecture) and Isonoura coast (Wakayama Prefecture). We open Ocean's Love surfing schools in various places with the desire to create an environment where disabled children from all over the country can enjoy the fun of the ocean. Hawaii School was opened for the first time in 2014. So far, Hawaii School was opened for 3 times in total including 2015 and 2017. The number of children, volunteers and support companies increase every year, and Ocean's Love activities are expanding nationwide. LDH JAPAN shares these ideas and our staff members also participate in these activities every year as volunteers. Reception for the volunteers starts! After volunteers check in, they bring tents, chairs, surfboards and other things that will be needed at the surfing school to the location. All work is distributed, and everyone neatly starts setting up the venue! There are many experienced volunteers, so the set-up is finished very quickly! Angela greets the volunteers and explains things to be careful about. The volunteers are divided into teams. She introduces the information about the children you are in charge of, holds meetings, offers to hold simulation to volunteers and gives a detailed explanation on how to teach the children. Reception for the children starts! Reception for the children participating in the event starts! Each team welcomes the children and makes preparations. We finish changing clothes for the children and finally the school begins. First of all, the children do self introduction. After that, they carefully warm up and practice surfing on the beach! After practice is over they can surf in the ocean! After getting out to the shore, everyone cleans the beach before lunch. The long-awaited lunch time comes! Members of each team gather together to have lunch! When lunch is over, it is time to create memories. The children make a photo frame with seashell as they like. All the people take a group photo together. The children face the ocean and say: "Thank you for today!" They also say their thanks to the volunteers standing beside them! At the end, we hand over the souvenirs and see the children off. The volunteers clean up the venue after sending off the children. At conclusion Angela thanks everyone. Thank you for your hard work! Today's surfing school is over! I happen to have a disabled brother. Since long ago, I have always wanted to do something for those in need of support. At that time, I came across a surfing school for autistic children in Hawaii and decided to participate as volunteer. Before coming to the ocean and riding on the waves the children kept their heads down and avoided eye contact with me. But when they went to the ocean, caught a wave and came back... Their faces brightened up instantly! I heard them shout, "One more time! One more time!" When I saw how the healing powers of the ocean could make these kids smile so brightly, I thought to myself: "This is what I need to be doing as a human being and a professional surfer!" Compared with the United States, disabled children in Japan are more self-enclosed, so I think surfing school is going to be a meaningful thing to do in Japan. Being a professional surfer, I go to the ocean every day. I have always felt the love and healing energy from it. I have learned to respect, appreciate and love Mother Nature through surfing. I started to think "how it would be nice to share this energy with many more people". This is what motivated me to start Ocean's Love. Among my activities, Ocean's Love surfing schools are very special to me. There are children who cannot go to the ocean sometimes and the children who know nothing about such a sport as surfing. It was my first attempt to open such a school in Japan, so I had a lot of worries in the beginning. But thanks to the support of many people, Ocean's Love entered its 13th year. We gain strength from the smiles on children's faces and learn things from them every year. Our goal is to "Open Ocean's Love surfing schools all over Japan!" and let more children know the charm of the ocean and the fun of surfing. We hope that with the power of the ocean, we can put a smile on their faces. We hope that more people can have better understanding of those with disabilities and create a disabled friendly society through Ocean's Love activities.